Gift Vouchers – the gift of good health! Are you looking to treat a loved one to some well-earned pampering and wellness therapy? Acupuncture can be used to treat specific ailments or to generally boost energy and promote relaxation. Acupuncture works on a subtle level by increasing the flow of blood around the body without any chemical interference. It utilises the body’s own reserves to regain strength, just as nature intended. Vouchers can be purchased for either a single treatment or for a course of treatments. Credit card payment can be made by phone and vouchers will be posted to your specified address. (Email vouchers can be issued if there’s a rush). 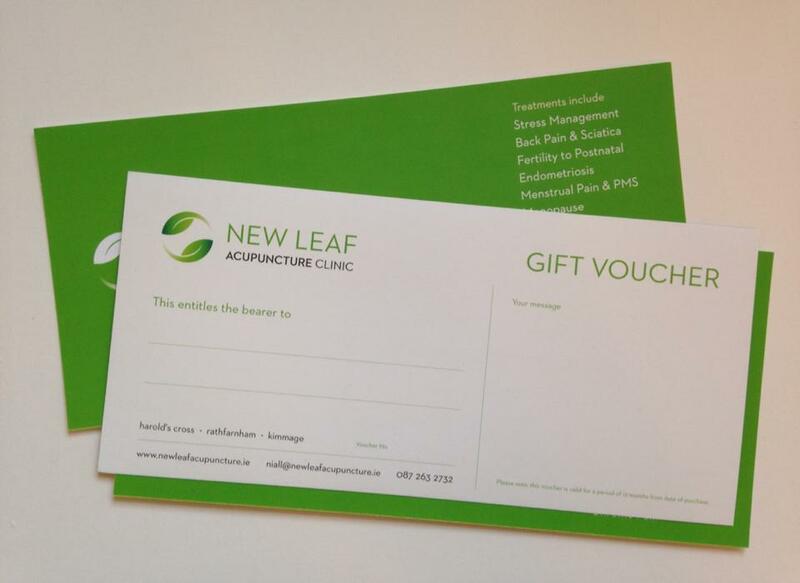 Call on 087 2632732 or email info@newleaf.ie and we will send the voucher to you or to the recipient.